three blow down valves located on the left side of the boiler compartment just above the steering gearbox. The blow off is perhaps the simplest mechanical device on a Stanley. It is nothing more than a valve. It is plumbed into the bottom of the boiler such that when the valve is open water from the bottom of the boiler is exhausted. Closing the valve stops the operation. All water sources contain impurities. Additionally there is steel piping in the water system that will rust and other opportunities for dirt and such to find its way to the boiler. In fact, all Stanley cars were equipped with steam syphons that allowed water to be sucked up from a horse trough or a stream alongside the road and these obviously would include all sorts of questionable material. When you've driven the car for several hundred miles you must "blow down" the boiler. This process simply exhausts the water from the boiler that has become concentrated with impurities. You then replenish the water blown out of the boiler with fresh and start the process over again. The photo at the left shows three of the six blow down valves installed on my car. The left one blows down the front left portion of the boiler while the middle valve is for blowing down the left rear portion of the boiler. 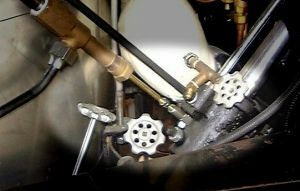 One of the special purpose blow downs is the valve to the right that is for blowing out the boiler water level indicator to insure it remains clear of residue and continues to function properly. The process of boiling water into steam causes only the water to turn into steam. All the impurities and such remain behind. As you drive a steam car you're constantly converting water into steam and that steam eventually leaves the car (all the packings are not perfectly tight; condensing cars don't condense all the steam used, etc) so that you have to refill the water supply tank that replenishes the boiler as you drive. This means that you are constantly putting "dirty water" into the boiler while only pure water leaves the car in the form of escaped and exhausted steam. This process of "blowing down the boiler" allows the water in the boiler that has become contaminated with impurities to be expelled so that fresh, less contaminated water can take its place. If a driver fails to perform this task the boiler eventually develops a thin layer of these deposits on the bottom surface of the boiler. This material acts as in insulator and doesn't allow good heat transfer from the bottom metal plate of the boiler into the water contained in the boiler. The result is the boiler doesn't "steam" as well ~ it doesn't produce steam as efficiently for a gallon of fuel burned as it did when the boiler is new. The process of blowing down the boiler helps to wash this material out of the boiler so that it continues to heat and operate at peak efficiency. If this material build-up gets too thick on the bottom of the boiler then most of the heat transmission through the steel and into the water will cease and the steel plate bottom of the boiler actually starts to overheat because there is no water (just the insulating effect of the deposits) in contact with the steel keeping the steel cool. This can create serious damage to the boiler and generally results in the flue tubes starting to leak where they are fitted to the steel plate bottom (flue sheet) of the boiler. Another serious effect of not regularly blowing down a boiler is the phenomenon of "foaming". Impurities and chemicals can build up in the boiler water to the point that the bubbles of steam start forming on the impurities suspended in the water. Instead of a normal rate of steam being generated all of a sudden there's a rapid increase in the generation of steam. This rapid steam generation makes the water take on a consistency not unlike the white foamy head on a freshly drawn beer or what results if you take a warm, well shaken can of soda and open it. Now, instead of pure steam going to the engine you have foam going to the engine. As the foam is a high percentage of water and there are very close tolerances within the engine cylinders, if too much foam gets into the cylinders the water in the foam won't compress like steam and blowing the cylinders apart becomes a real possibility along with other significant engine damage. In a like manner the foam with all it's impurities going through the superheater will cause the water to flash into steam while the impurities are left behind on the walls of the superheater causing it to become less efficient. An experienced steam car owner will hopefully recognize the decreased performance of the boiler, the erratic operation of the car's gauges, and the way the engine is running as attributed to boiler foaming and shut the car down before any serious damage can occur. Depending on the model Stanley in question, one or more blow off valves could be located around the perimeter of the boiler. On restored Stanley cars it is not uncommon to see three, four, or five valves around the lower perimeter of the boiler for blow off purposes. In addition to the blow off valves around the lower perimeter of the boiler there are also additional ones serving specific purposes. One device not shown on the diagram is the boiler water level indicator. There were several forms of devices used to indicate the water level in a boiler. Most notably was the three-tube indicator on earlier cars. Later models used what was called a kidney indicator which was a float-based system. Both of these indicator system included blow off valves to clear their lines to insure accurate readings. When opening a blow off valve it is good practice not to close the valve tight initially. Sometimes small bits of grit and rust can get lodged on the valve seat during the blowing down operation. These debris will not allow the valve stem to seat properly and if the handle is closed tightly the debris may be ground into the soft brass valve seat. The rotation of the valve stem on the valve seat will also cause the debris to cut grooves in the seat which become the pathways for the valve to leak. A recommended practice is to close the valve just to the valve stem reaches the valve seat. At that point it is good practice to open the valve a quarter turn and reseat the valve stem on the seat. If with a little bit of pressure the valve closes then that is how it should be left. If the valve does not close off then repeat the opening and reseating a couple more times. Observe the end of the blown down line connected to the valve for leaking but remember that it may appear to be leaking when it is really the remaining steam and water in the line draining. If the valve continues to leak then it will be necessary to dress the valve seat and the end of the valve stem to make a better seal.